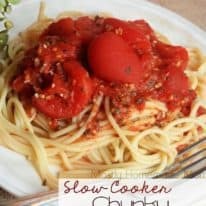 You’d be hard-pressed to find a jarred chunky tomato sauce that even comes close to the flavor of this homemade Crockpot version! 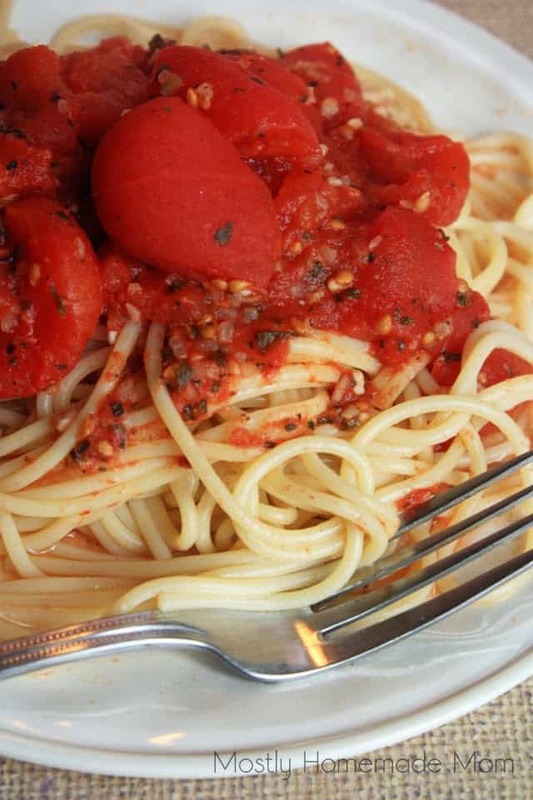 Whole tomatoes, onion, garlic, and basil – serve over hot pasta or fluffy brown rice! 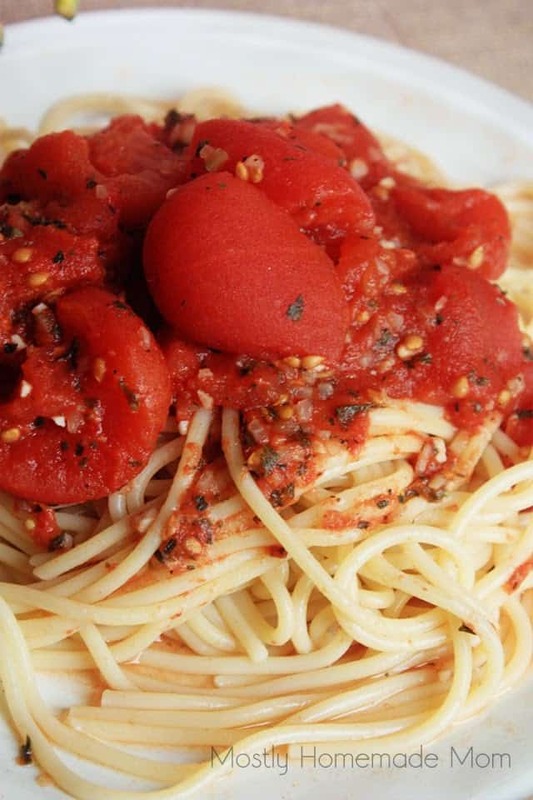 Is there anything more comforting than a big plate of spaghetti with sauce piled high? It was for sure one of my favorite dinners to make when Paul and I were first married. 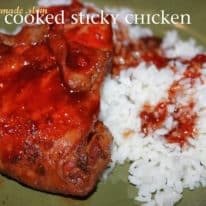 Heck, it’s STILL one of my favorite dinners to whip up for our family! My mom used Ragu chunky sauce pretty exclusively, while Paul was used to Prego growing up. It’s crazy how loyal people are to their favorite tomato sauce brands! When we were first married though, I pretty much bought whatever was on sale. We ate it and we liked it – ha! The past 6 months or so I’ve become acutely aware of how crazy the ingredients are in some store bought items – tomato sauce being one of them. And the sugar – oh my word, the sugar! As if there isn’t enough to spike the blood sugar in the spaghetti, they have to sneak it in the sauce too! This mama was not pleased with the selection after realizing this fact. And the brands that are more simple, are usually more expensive. WAY more expensive. 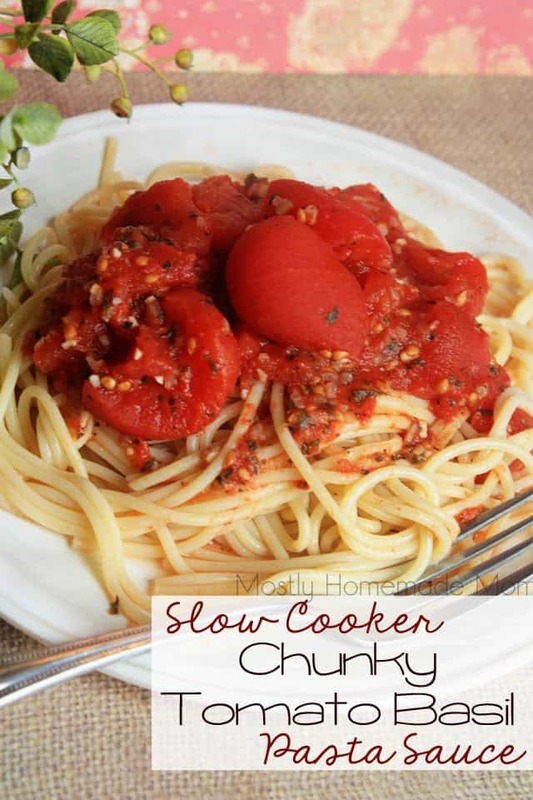 This slow cooker chunky sauce is probably my favorite to date that I’ve made – and I can’t wait to share it with you! Homemade is totally the way to go with sauce. As a side note, Silas is not really into chunky anything – but after picking out the larger chunks of tomatoes, he still loved this sauce! 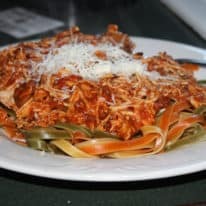 You'd be hard-pressed to find a jarred chunky tomato sauce that even comes close to the flavor of this homemade Crockpot version! Whole tomatoes, onion, garlic, and basil - serve over hot pasta or fluffy brown rice! Empty cans of tomatoes in the bottom of Crockpot. Carefully quarter the tomatoes in the bottom of the crock. Add in minced onion, garlic, wine, basil, parsley, salt, and pepper. Cook on high for 2 hours or low for 4 hours. Taste sauce and add additional salt if needed. It looks so fresh and pretty! 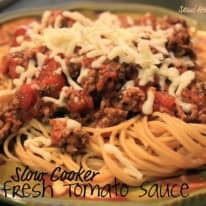 I love slow cookers!! I totally need to try this! It looks so yummy! friends, because if prefer to read it then my all friends will too. has really improved my knowledge. I am greatly thankful to you! I’ve learnt much outstanding stuff here. much effort you have done to make this amazing informative site. recurrently? It is made up out of nice stuff. much your post, very interesting, from where you have got this information. will make the most of this information and spread it amongst my friends too!